I remember when I tried my first Keurig machine. I was in an office waiting room and was completely excited not only that I could freshly brew a cup of coffee but also that I had a selection of 6-8 different coffees to choose from. It’s almost empowering to be able to select my coffee and then hit the little “Brew” button. Initially I thought this cool brewer was limited to the office, but Keurig offers many options that are perfect for home use as well. 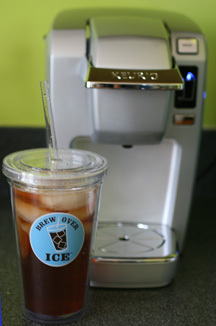 During these hot summer months, you can even take your Keurig to the next level by using your machine to brew some delicious iced teas or iced coffees as well. With the intense heat today, who wants to leave the comfort of their cool air conditioned cubicle or comfy couch to get the daily coffee or tea? With Brew Over Ice K-Cup® portion packs for your Keurig Brewer there is no need to go to the coffee shop around the corner or the coffee cart down the street. Cooling down with iced coffee or tea has never been easier. 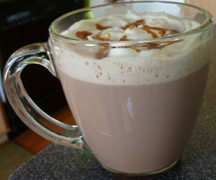 Especially with the extreme temperatures, the ease and convenience of making an iced beverage in your home or office is a heat-wave must have. Iced beverages are the perfect way to cool down! Even though it’s summer, some mornings I really want my morning coffee or my morning chai. I used to go to the coffee shop down the street to pick-up my morning brew, but ever since the Keurig MINI Plus Brewing Machine landed on my kitchen counter, I’ve saved time, gas, and money on my morning pick-me-ups. I love that I can choose from over 200 varieties of K-cups (there are 238 on the Keurig website) which means if my tastes change, my coffee can change with me. The Keurig is just as easy to use at home as it was in the office. Simply add 6 oz. to 10 oz. of water (depending on how strong you want your brew) and hit the “Brew” button. The Keurig will automatically heat the water and then start brewing once the water reaches optimal brewing temperature. Here’s a video where you can see the Keurig in action. After the water is heated, you have freshly brewed coffee or tea in under a minute. One hot day we brewed up some of the Southern Sweet Tea and were amazed at how delicious it tasted. It has a great gourmet, freshly brewed tea taste that is the perfect sweetness. It was so refreshing that we took it to-go in our cool double-walled cup and drank it while running errands. If you’re having an outdoor gathering, then consider setting up your Keurig outside with the rest of the food. Put out a collection of the Brew Over Ice K-Cups, a bowl of ice, and some sturdy plastic cups and let your guests choose their favorite iced coffee or tea. 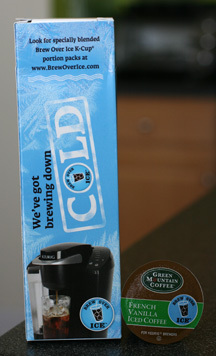 Keurig Brewing Systems and K-Cups are available online at the Keurig store or from Amazon.com. Many local grocery stores also carry some varieties of K-Cups as well. I can purchase K-Cups for less than $0.80 each which makes them affordable and budget friendly. I’ve had that happen to when the straws accidentally got placed in the dishwasher. SNAP! I just substitute regular plastic straws. The ones from McDonald’s are about the perfect fit!